Despite the increasing availability of credit, Indians still believe in household savings and a vast number of people are reluctant to splurge on credit. But that is not the case when it comes to festivals. Festivals are occasions when people go all out making high-ticket purchases on credit cards, as has been evident from the Christmas and New Year spends. During the two days of Christmas eve and Christmas, credit cards witnessed a spurt of 61 per cent in terms of volume of transactions while the value of commerce was up by 74 per cent. During these days, debit card purchases were down by 10 per cent in volume terms and 11 per cent in commerce value, as per the data from Worldline India, a payment processing company. On New Year eve and New Year day too, credit card transactions went up by 18 per cent in volume terms and 50 per cent in commerce value against debit card purchases that were down by 28 per cent, both in terms of volume and value. During normal days, debit card purchases are higher in both volume and value as there are 832 million debit cards in circulation against 34 million credit cards. 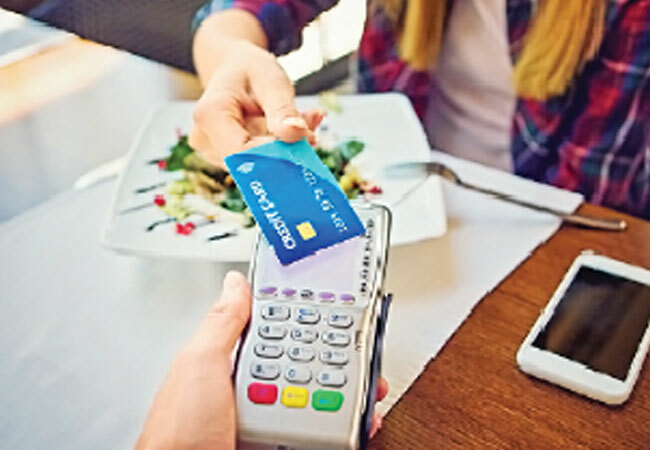 “The high use of credit cards on Christmas and New Year could be because such days naturally witness higher ticket size per transaction and for higher ticket sizes, people tend to use credit cards for which they can pay later,” said Deepak Chandnani, MD, Worldline South Asia & Middle East, and MD, MRL Posnet. On days like Diwali as well, we saw a growth of close to 150 per cent in volume and value of transactions as compared to 2016, he added. However, this was not the case in 2016 as the Christmas and New Year festivities were shrouded by the cash crunch post demonetisation. During that period, people were busy making everyday purchases through cards and there was little room left for festive splurging. During 2016 Christmas, debit card purchases were up 234 per cent in volume terms and 120 per cent in value terms, while credit card spends were marginally up by five per cent in volume and were down by 25 per cent in value. During the New Year too debit card spends were significantly higher by 381 per cent volume-wise and 241 per cent value-wise. Credit card purchases too were up, but not to this level. Cash-starved people spent 33 per cent more through credit cards. “Debit card volume and value grew tremendously in 2016 as demonetisation was in effect. A large number of new and dormant debit cards started getting used for small and large expenses. In 2017, this usage reduced marginally as people had the option of using cash or cards for expenses,” said Chandnani. Credit cards were also used for purchases during demonetisation but not as widely as debit cards, which are available with a much larger section of the population. Debit card gets issued when a bank account is opened and is a mean by which a bank customer accesses his or her money. Credit cards, on the other hand, are issued based on the creditworthiness of the client.